EVERETT – What set up as an interesting pitching matchup between a Major League Baseball veteran and a surprising prospect turned into a battle of attrition. 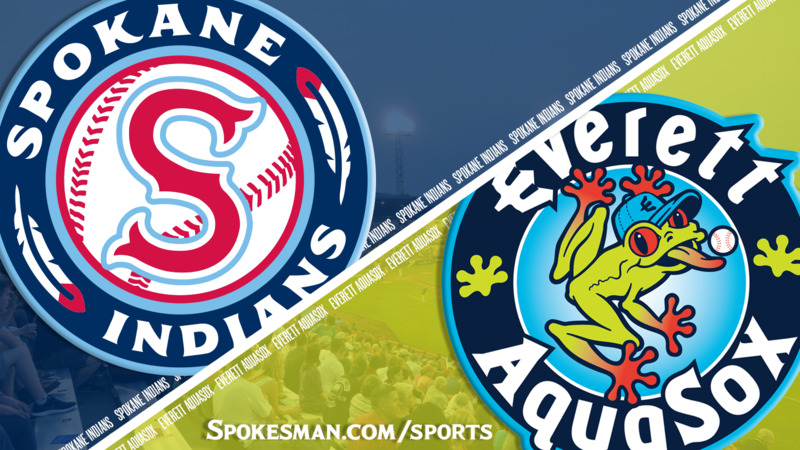 In Game 1 of the Northwest League North Division series, league MVP Curtis Terry drove in four and the Spokane Indians outlasted the Everett AquaSox 7-3 on Wednesday at Memorial Stadium. Game 2 in the best-of-three series is Thursday at Avista Stadium at 6:30 p.m.
Yerry Rodriguez entered with a 3-0 record over four starts for the Indians with a 1.82 ERA with a 27 strikeouts against five walks over 24 2/3 innings. The AquaSox sent MLB veteran right-hander Hisashi Iwakuma, 37, on a rehab assignment recovering from shoulder surgery from their parent club Seattle Mariners. Neither pitched particularly well and the Indians ended up on the better side of the equation. With one down in the first, J.P. Martinez doubled to right and stole third, then Terry drew a walk. Diosbel Arias lined out to right, but Martinez busted it down the line and beat the throw with a reaching slide around catcher Cal Raleigh. Sherten Apostal singled and Tanner Gardner walked to load the bases, but Francisco Ventura grounded to second to end the early rally. Jax Biggers drew a two-out walk in the second and Martinez (3 for 5, two runs, two steals) chopped a single over the third baseman. Terry, the NWL MVP, clubbed one to center that hit off the wall for a two-run double and 3-0 lead. Iwakuma left after two. He threw 46 pitches, 26 for strikes with three bases on balls. Everett got on the board in the bottom of the second on Connor Kopach’s two-run homer to Memorial Stadium’s short porch in right – the first homer allowed by Rodriguez this season. Mariners fourth-round pick lefty Michael Plassmeyer took over in the third and was greeted rudely. Tanner Gardner drew a one-out walk, then Ventura blasted his first homer since July 27 to make it 5-2. The Indians proceeded to load the bases on three consecutive singles. After a force out, the AquaSox changed pitchers to Noah Zavolas to face Terry. On Zavolas’ first pitch, Terry went the other way for a two-run single and 7-2 lead. Everett got a run back in the bottom half on a bases-loaded walk issued by Rodriguez. Rodriguez was finished after four innings. He gave up three runs on five hits and four walks with two strikeouts. He threw 82 pitchers, just 44 for strikes. Indians reliever John King owned the middle innings, retiring 12 out of 13 batters faced with four strikeouts, to earn the win. Emmanuel Clase tossed a 1-2-3 ninth with a pair of Ks to seal the it. Published: Sept. 5, 2018, 10:20 p.m. Updated: Sept. 5, 2018, 10:35 p.m.